It was so nice to have an extra weekend day. I did a bit of sewing and cleaning, got a haircut. All sorts of nice weekend things. This evening I started ironing interfacing onto the back of Ryan's shirts for his graduation quilt. 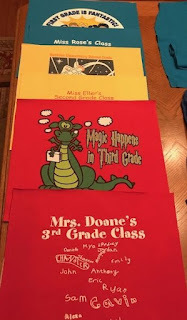 So far I've finished the front and back of shirts for grades one, two and three. I have to keep the backs, that is where their names are. I'll have Ryan sort through some of the shirts. I think that there are way too many. Some of them are just ugly, and some of them probably aren't that important to him. The ones with the little names on the back are important to me. Those are definitely going to stay. It is so cold here that I had to turn on the heater! It makes me just want to curl up in bed and stay put. I felt that way every day of winter when we lived up north. Kurt is in DC and it was hovering around 0 when he landed. Brrr! Glad that it is him and not me. I think that all the links are up to date on the RSC19 Tiny Tuesday Sampler blocks. There is one scheduled for the morning, but the PDF is available on the RSC19 Sampler tab right now. T shirt quilts are so much fun but it is definitely hard to decide which ones to use. We had a little snow this weekend and it was about 29 all day.Just a few more months and it will start to warm up. We're very cold here in the Midwest too. While I was at quilt retreat all weekend, we received freezing rain followed by a couple of inches of snow. I drove home yesterday and the temperature had risen to a balmy 22! Great weekend for a sew-in! Love the Tiny Tuesday block this week again!!! Smart thinking on getting an early start on Ryan's T-Quilt!! Here's hoping that it cooperates more than my niece's quilt has. Sigh! Cute, cute t-shirts. I sure wish my sons had t-shirts from each grade in school. This is going to be a wonderful quilt! Make a double sided quilt. Use the extra blocks on the back. A friend of mine was making a t shirt quilt and several (but not all) shirts had a list of names. She decided to put all of the name lists sections on the back of the quilt. Unfortunately, it meant she had to make her backing fabric rather than just piece two lengths of fabric together. But it does preserve the names really well.